The unsteady motion of an Oldroyd-B fluid over an infinite flat plate is studied by means of the Laplace and Fourier transforms. After time t = 0, the plate applies cosine/sine oscillating shear stress to the fluid. The solutions that have been obtained are presented as a sum of steady-state and transient solutions and can be easily reduced to the similar solutions corresponding to Newtonian or Maxwell fluids. They describe the motion of the fluid some time after its initiation. After that time when the transients disappear, the motion is described by the steady-state solutions that are periodic in time and independent of the initial conditions. Finally, the required time to reach the steady-state is established by graphical illustrations. 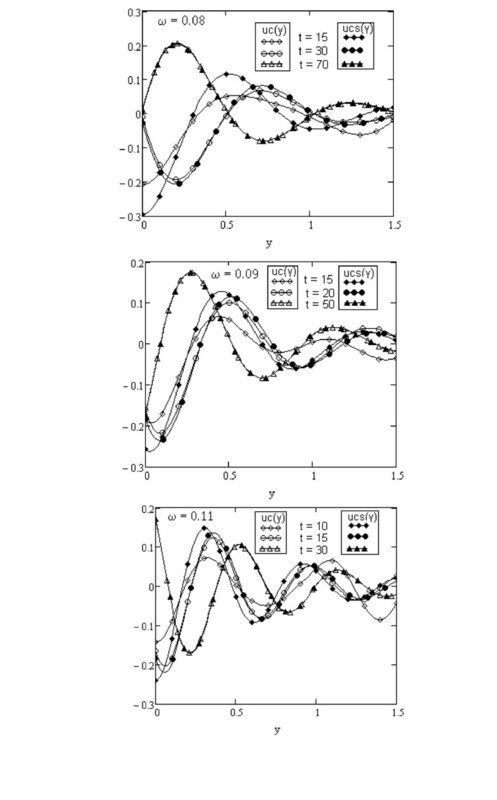 It is lower for cosine oscillations in comparison with sine oscillations of the shear, decreases with respect to ω and λ and increases with regard to λ r .
Mathematical Subject Classification (2010): 76A05; 76A10. The laminar flow of a great number of fluids such as polymeric liquids, food products, paints and so forth cannot be adequately described by means of the classical linearly viscous Newtonian model. The interest into motion problems of such fluids, also called non-Newtonian fluids, has considerably grown due to their multiple applications. 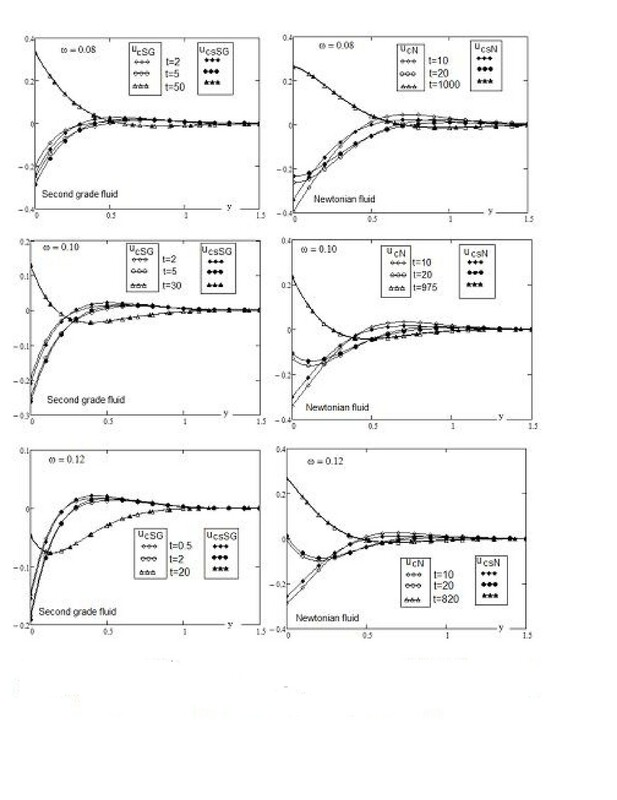 Among the many models that have been used to describe the behavior of non-Newtonian fluids, the rate type models have received much attention. The first systematic thermodynamic study of such models is that of Rajagopal and Srinivasa , within which models for a variety of rate type viscoelastic fluids can be obtained. They showed that the Oldroyd-B fluid is one which stores energy like a linearized elastic solid, its dissipation however being due to two dissipative mechanisms that implies that they arise from a mixture of two viscous fluids. The first exact solutions corresponding to some motions of Oldroyd-B fluids seem to be those of Tanner  and Waters and King . Over the past few decades, the unsteady flows of viscoelastic fluids caused by the oscillations of the boundary are of considerable interest. Rajagopal  found steady-state solutions for some oscillating motions of second grade fluids and Erdogan  provided two starting solutions for the motion of a viscous fluid due to cosine and sine oscillations of a flat plate. Flows of the fluids due to oscillating boundary for different constitutive models can be found into [6–20]. However, all these articles deal with motion problems in which the velocity is given on the boundary. To the best of our knowledge, the first exact solutions for motions of non-Newtonian fluids due to an infinite plate that applies a shear stress to the fluid seem to be those of Waters and King  and Bandelli et al. . Recently , interesting solutions have been obtained for the motion of Newtonian fluids induced by an infinite plate that applies oscillating shear stresses to the fluid. This is very important as in some problems, what is specified is the force applied on the boundary. The "no slip" boundary condition may not be necessarily applicable to flows of polymeric fluids that can slip or slide on the boundary. Thus, the shear stress boundary condition is particularly meaningful and a closed-form expression for the starting solutions corresponding to the motion induced by a flat plate that applies an oscillating shear to an Oldroyd-B fluid has not been given before. 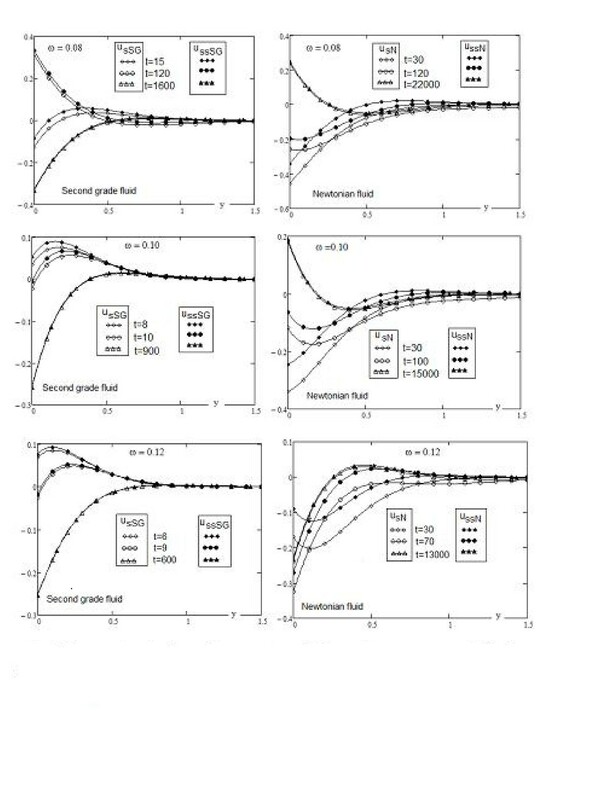 Consequently, the aim of this article is to determine starting solutions for the unsteady motion of an incompressible Oldroyd-B fluid due to an infinite plate that applies an oscillating shear to the fluid. 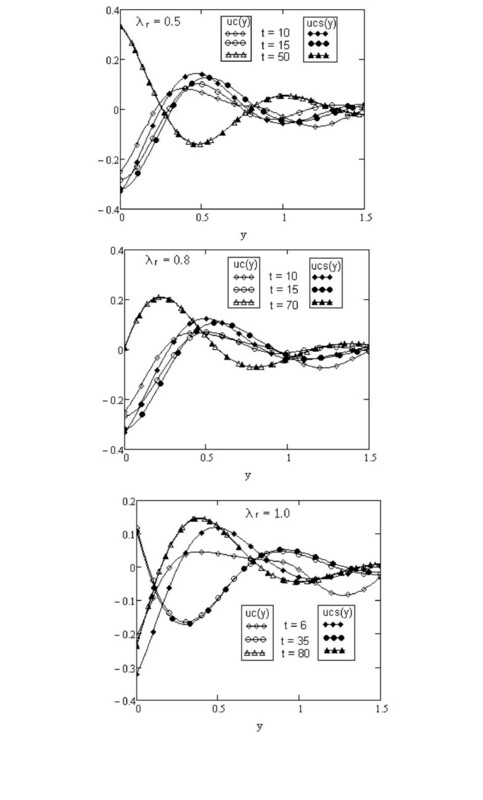 Such exact solutions, which are not common in the literature, provide an important check for numerical methods that are used to study flows of such fluids in a complex domain. They are presented as a sum of steady-state and transient solutions and satisfy both the governing equations and all imposed initial and boundary conditions. Furthermore, the similar solutions for Maxwell and Newtonian fluids can easily be obtained as limiting cases of general solutions. Finally, the influence of the material parameters on the fluid motion and the required time to reach the steady-state are determined by graphical illustrations. This time is lower for the cosine oscillations in comparison with the sine oscillations of the shear, decreases with respect to the relaxation time λ and the frequency ω of the shear and increases with respect to the retardation time λ r .
1 + λ ∂ ∂ t τ ( y , t ) = μ 1 + λ r ∂ ∂ t ∂ u ( y , t ) ∂ y ; y , t > 0 . 1 + λ ∂ ∂ t τ ( y , t ) y = 0 = μ 1 + λ r ∂ ∂ t ∂ u ( y , t ) ∂ y y = 0 = f sin ω t o r f cos ω t t > 0 .
also has to be satisfied. V ( y , t ) → 0 a s y → ∞ t > 0 . V ̄ ( y , q ) → 0 a s y → ∞ . V ̄ c 2 ( ξ , q ) = 2 π f ρ ( ν ξ 2 - λ ω 2 ) - i ω ( 1 + λ r ν ξ 2 ) ( ν ξ 2 - λ ω 2 ) 2 + ω 2 ( 1 + λ r ν ξ 2 ) 2 λ q + [ i λ ω + ( 1 + λ r ν ξ 2 ) ] λ q 2 + ( 1 + λ r ν ξ 2 ) q + ν ξ 2 .
α = 1 + λ r 2 ω 2 , β 2 = ω 2 ( λ - λ r ) ν ( 1 + λ r 2 ω 2 ) , γ = ω ( 1 + λ λ r ω 2 ) ν ( 1 + λ r 2 ω 2 ) . 2 A 2 = β 4 + γ 2 + β 2 , 2 B 2 = β 4 + γ 2 - β 2 a n d tan φ = 1 + λ 2 ω 2 - λ ω 1 + λ r 2 ω 2 1 + λ r 2 ω 2 + λ r ω 1 + λ 2 ω 2 .
b ( ξ ) = 1 + λ r ν ξ 2 , c ( ξ ) = ( 1 + λ r ν ξ 2 ) 2 - 4 ν λ ξ 2 . V 2 ( y , t ) = 2 π f ν μ α ∫ 0 ∞ cos ( y ξ ) ( ξ 2 - β 2 ) 2 + γ 2 ( ν ξ 2 - λ ω 2 ) c h c ( ξ ) t 2 λ + ( ν ξ 2 + λ ω 2 ) b ( ξ ) c ( ξ ) s h c ( ξ ) t 2 λ e - b ( ξ ) t 2 λ d ξ - i 2 π f ω ν μ α ∫ 0 ∞ cos ( y ξ ) ( ξ 2 - β 2 ) 2 + γ 2 b ( ξ ) c h c ( ξ ) t 2 λ + b 2 ( ξ ) - 2 λ ( ν ξ 2 - λ ω 2 ) c ( ξ ) s h c ( ξ ) t 2 λ e - b ( ξ ) t 2 λ d ξ .
u s ( y , t ) = f μ ν ω e - y B ( 1 + λ r 2 ω 2 ) ( 1 + λ 2 ω 2 ) 4 sin ω t - y A + φ + π 2 - 2 π f ω ν μ α × ∫ 0 ∞ cos ( y ξ ) ( ξ 2 - β 2 ) 2 + γ 2 b ( ξ ) c h ( c ( ξ ) t 2 λ ) + b 2 ( ξ ) - 2 λ ( ν ξ 2 - λ ω 2 ) c ( ξ ) s h ( c ( ξ ) t 2 λ ) e - b ( ξ ) t 2 λ d ξ .
u s s ( y , t ) = f μ ν ω e - y B ( 1 + λ r 2 ω 2 ) ( 1 + λ 2 ω 2 ) 4 sin ω t - y A + φ + π 2 .
which are periodic in time and independent of the initial conditions. However, they satisfy the governing equation and boundary conditions. As expected, they differ with a phase shift. T ̄ ( y , q ) = 2 π f μ ρ ∫ 0 ∞ ξ sin ( y ξ ) 1 1 + λ q 1 q - i ω λ r q + 1 λ q 2 + ( 1 + λ r ν ξ 2 ) q + ν ξ 2 d ξ .
M ( ξ ) = λ ν ( 1 + λ 2 ω 2 ) ξ 2 ( λ ω γ - β 2 ) + ( γ 2 + β 4 ) + i [ ξ 2 ( γ + λ ω β 2 ) - λ ω ( γ 2 + β 4 ) ] ξ 2 ( ( ξ 2 - β 2 ) 2 + γ 2 ) , N ( ξ ) = 1 ω ( 1 + λ 2 ω 2 ) - ξ 2 ( γ + λ ω β 2 ) + λ ω ( γ 2 + β 4 ) + i [ ξ 2 ( λ ω γ - β 2 ) + ( γ 2 + β 4 ) ] ( ξ 2 - β 2 ) 2 + γ 2 ) . T 1 ( y , t ) = - f 1 + λ 2 ω 2 + i f λ ω 1 + λ 2 ω 2 e - t λ .
T 2 ( y , t ) = f e - y B 1 + λ 2 ω 2 cos ( ω t - y A ) + λ ω sin ( ω t - y A ) + i ( sin ( ω t - y A ) - λ ω cos ( ω t - y A ) ) . where tan ψ = λω. G ( ξ , q ) = M ( ξ ) q + b ξ 2 λ λ ( q + b ξ 2 λ ) 2 - ( b ξ 2 λ ) 2 + - b ( ξ ) M ( ξ ) λ c ( ξ ) + 2 N ( ξ ) c ( ξ ) c ξ 2 λ ( q + b ξ 2 λ ) 2 - ( c ξ 2 λ ) 2 .
p ( ξ ) = ν ξ 4 [ λ r ω ( λ ω γ - β 2 ) + 2 ( γ + λ ω β 2 ) ] + ω ( γ 2 + β 4 ) + ω ξ 2 [ ( λ ω γ - β 2 ) - ν ( γ 2 + β 4 ) ( 2 λ - λ r ) ] , r ( ξ ) = ν ξ 4 [ 2 ( λ ω γ - β 2 ) - λ r ω ( γ + λ ω β 2 ) ] + ξ 2 [ ν ( γ 2 + β 4 ) ( 2 + λ λ r ω 2 ) - ω ( γ + λ ω β 2 ) ] + λ ω 2 ( γ 2 + β 4 ) . τ c ( y , t ) = - f 1 + λ 2 ω 2 e - t λ + f e - y B 1 + λ 2 ω 2 cos ( ω t - y A - ψ ) + 2 f π ( 1 + λ 2 ω 2 ) ∫ 0 ∞ sin ( y ξ ) ξ [ ( ξ 2 - β 2 ) 2 + ( γ ) 2 ] × ( ξ 2 ( λ ω γ - β 2 ) + ( γ 2 + β 4 ) ) c h c ( ξ ) t 2 λ - p ( ξ ) ω c ( ξ ) s h c ( ξ ) t 2 λ e - b ( ξ ) t 2 λ d ξ .
τ s ( y , t ) = f λ ω 1 + λ 2 ω 2 e - t λ + f e - y B 1 + λ 2 ω 2 sin ( ω t - y A - ψ ) + 2 f π ( 1 + λ 2 ω 2 ) ∫ 0 ∞ sin ( y ξ ) ξ [ ( ξ 2 - β 2 ) 2 + ( γ ) 2 ] × ξ 2 ( γ + λ ω β 2 ) - λ ω ( γ 2 + β 4 ) c h c ( ξ ) t 2 λ + r ( ξ ) ω c ( ξ ) s h c ( ξ ) t 2 λ e - b ( ξ ) t 2 λ d ξ .
also differ by a phase shift. The property seems to be not true for the transient solutions. This is the reason that we separately gave the starting solutions for both cosine and sine oscillations of the shear stress on the boundary. τ c M ( y , t ) = - f 1 + λ 2 ω 2 e - t λ + f e - y B 1 + λ 2 ω 2 cos ( ω t - y A - ψ ) + 2 f π ∫ 0 ∞ sin ( y ξ ) e - t 2 λ ξ ( ν ξ 2 - λ ω 2 ) 2 + ω 2 × ω 2 c h 1 - 4 λ ν ξ 2 2 λ t - ω 2 + 2 ν ξ 2 ( ν ξ 2 - λ ω 2 ) 1 - 4 λ ν ξ 2 s h 1 - 4 λ ν ξ 2 2 λ t d ξ .
τ s M ( y , t ) = f λ ω 1 + λ 2 ω 2 e - t λ + f e - y B 1 + λ 2 ω 2 sin ( ω t - y A - ψ ) + 2 f ω π ∫ 0 ∞ sin ( y ξ ) e - t 2 λ ξ ( ν ξ 2 - λ ω 2 ) 2 + ω 2 × ( ν ξ 2 - λ ω 2 ) c h 1 - 4 λ ν ξ 2 2 λ t + ν ξ 2 + λ ω 2 1 - 4 λ ν ξ 2 s h 1 - 4 λ ν ξ 2 2 λ t d ξ .
α = ν λ r , δ = α ω ν , β 2 = α ω 2 ν 2 ( 1 + δ 2 ) , γ = ω ν ( 1 + δ 2 ) , 2 A 2 = γ ( 1 + δ 2 - δ ) , 2 B 2 = γ ( 1 + δ 2 + δ ) , t a n φ = ( 1 + δ 2 - δ ) . corresponding to the flow of a Newtonian fluid. In this article, the unsteady motion of an incompressible Oldroyd-B fluid over an infinite plate that applies an oscillating shear stress to the fluid is studied by means of integral transforms. The starting solutions that have been obtained for velocity and shear stress are presented as a sum of steady-state and transient solutions. They describe the motion of the fluid some time after its initiation. After that time, when the transients disappear, the starting solutions tend to the steady-state solutions that are periodic in time and independent of the initial conditions. However, they satisfy the governing equations and boundary conditions. Furthermore, as it was to be expected, the steady-state solutions corresponding to the cosine oscillations of the shear differ with a phase shift from those due to the sine oscillations of the shear. This property is not true for the transient components of solutions. This is the reason that we separately gave the starting solutions for both cosine and sine oscillations of the shear stress on the boundary. v 0 , t = V cos ω t o r v 0 , t = V sin ω t ; t > 0 .
for instance, has the same form as τ sN (y, t) given by Equation (56). This is not a surprise because, for Newtonian fluids, Equations (3) and (4) together with the balance of linear momentum lead to a governing equation for shear stress of the same form as that for velocity. Generally, the starting solutions for unsteady motions of fluids are important for those who need to eliminate the transients from their rheological measurements. Consequently, an important problem regarding the technical relevance of these solutions is to find the required time to get the steady-state. More exactly, in practice it is necessary to know the approximate time after which the fluid is moving according to the steady-state solutions. 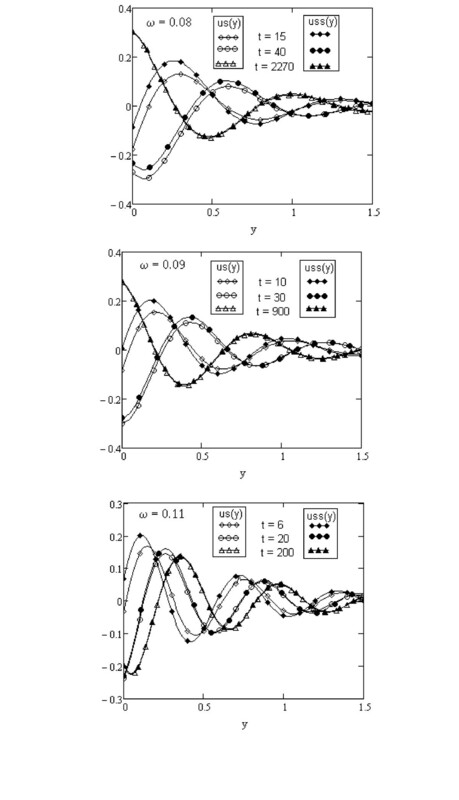 For this, the variations of the starting and steady-state velocities with the distance from the plate are depicted in Figures 1, 2, 3, 4, 5, 6, 7, and 8 for sine and cosine oscillations of the shear stress on the boundary. At small values of time, the difference between the starting and steady-state solutions is meaningful. This difference decreases in time and it is clearly seen from figures that the required time to reach the steady-state for the sine oscillations is higher in comparison with the cosine oscillations of the shear. This is obvious, because at t = 0 the shear stress on the boundary is zero for sine oscillations. Comparison between the starting velocity u s ( y , t ) and the steady-state velocity u ss ( y , t ), for f = 6, ν = 0.004, μ = 3.92, λ = 8, λ r = 4 and different values of time t and frequency ω. Comparison between the starting velocity u s ( y , t ) and the steady-state velocity u ss ( y , t ), for f = 6, ν = 0.004, μ = 3.92, λ r = 0.5, ω = 0.08 and different values of time t and the relaxation time λ. Comparison between the starting velocity u s ( y , t ) and the steady-state velocity u ss ( y , t ), for f = 6, ν = 0.004, μ = 3.92, λ = 4, ω = 0.08 and different values of time t and the retardation time λ r .
Comparison between the starting velocity u c ( y , t ) and the steady-state velocity u cs ( y , t ), for f = 6, ν = 0.004, μ = 3.92, λ = 8, λ r = 4, and different values of time t and frequency ω. Comparison between the starting velocity u c ( y , t ) and the steady-state velocity u cs ( y , t ), for f = 6, ν = 0.004, μ = 3.92, λ r = 0.5, ω = 0.08 and different values of time t and the relaxation time λ. Comparison between the starting velocity u c ( y , t ) and the steady-state velocity u cs ( y , t ), for f = 6, ν = 0.004, μ = 3.92, λ = 4, ω = 0.08 and different values of time t and the retardation time λ r .
Comparison between the starting velocity and steady-state velocity for second grade and Newtonian fluids for f = 6, ν = 0.004, μ = 3.92, α = 0.016 and different values of time t and frequency ω (sine oscillations). Comparison between the starting velocity and steady-state velocity for second grade and Newtonian fluids for f = 6, ν = 0.004, μ = 3.92, α = 0.016 and different values of time t and frequency ω (cosine oscillations). Of course, the required time to reach the steady-state depends on the material constants and the frequency ω of the shear. 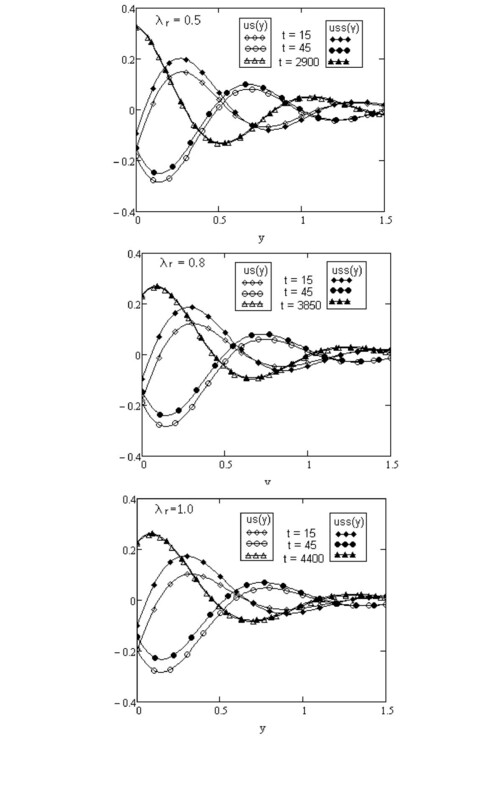 Figures 1 and 4 show the influence of ω on the fluid motion. Furthermore, the required time to reach the steady-state decreases for increasing ω. 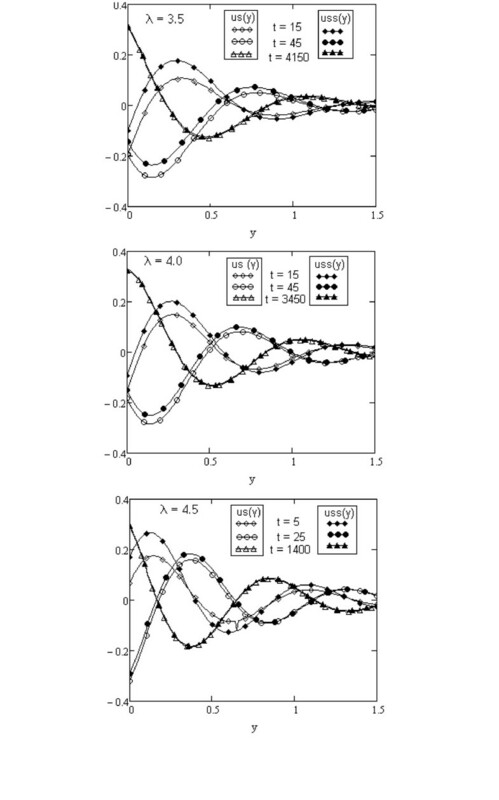 The influence of the relaxation and retardation times λ and λ r on the fluid motion is underlined by Figures 2, 3, 5, and 6. The two parameters, as expected, have opposite effects on the motion. The required time to reach the state-state decreases with respect to λ and increases with regard to λ r for both types of oscillating shear. The steady-state is rather obtained for a Maxwell fluid in comparison with an Oldroyd-B fluid having the same relaxation time λ. 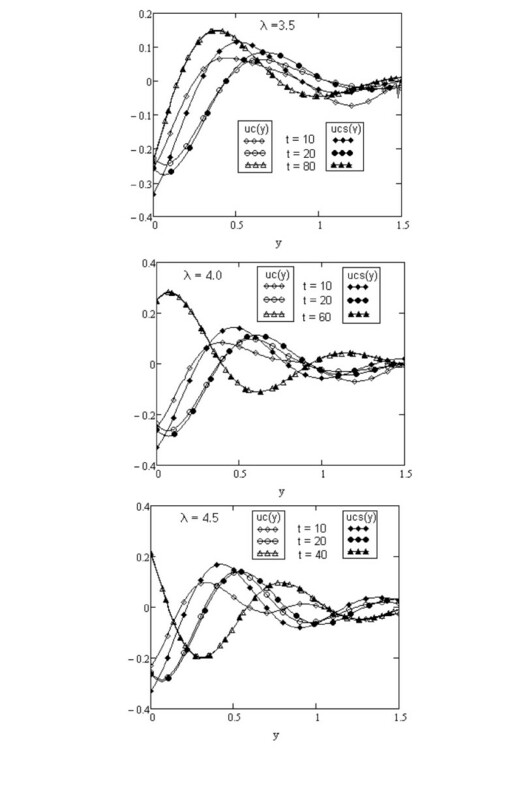 Figures 7 and 8 show the influence of ω on the motion of second grade and Newtonian fluids. As expected, the required time to reach the steady-state is lower for second grade fluids in comparison with Newtonian fluids. b 2 = ω 2 ( λ - λ r ) ν ( 1 + λ r 2 ω 2 ) , c = ω ( 1 + λ λ r ω 2 ) ν ( 1 + λ r 2 ω 2 ) , 2 A 2 = b 4 + c 2 + b 2 , 2 B 2 = b 4 + c 2 - b 2 . The authors would like to express their gratitude to reviewers for fruitful remarks and suggestions regarding the initial version of the manuscript. N. Shahid and M. Rana are highly thankful and grateful to Abdus Salam School of Mathematical Sciences GC University, Lahore, Pakistan and Higher Education Commission of Pakistan for generously supporting and facilitating this research work. The authors' contribution for this article is as follows: NS 35%, MR 35%, and IS 30%. All authors participated in the design of the study and established exact solutions. NS and MR have had a special contribution to get the simplest form of steady-state solutions. IS prepared the most part of graphical illustrations while NS and MR participated in the sequence alignment and drafted the manuscript. All authors participated in drawing conclusions, reading and approving the manuscript.